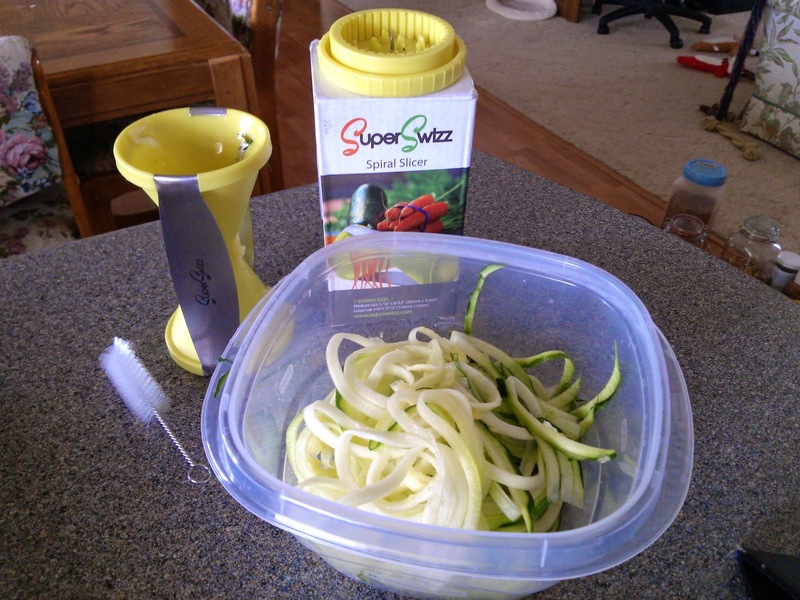 I've always wanted to try a veggie "noodle-maker" to complement my low-carb diet, so I was really excited to review the SuperSwizz Spiral Slicer. This is a small hand-held slicer with sturdy stainless steel Japanese blades; One side makes thicker alfredo-style "noodles" and the other side creates a thinner spaghetti-like "noodle" out of raw vegetables. The Spiral Slicer is really easy to use - just hold the metal grips and twist your zucchini (or carrot or any raw firm veggie) into the slicer like a pencil sharpener. Be sure to hold it over a bowl or plate for the noodles to fall onto. Once the vegetable gets down to a nub, you can attach the gripping tool to the top of it to keep turning it into the slicer. 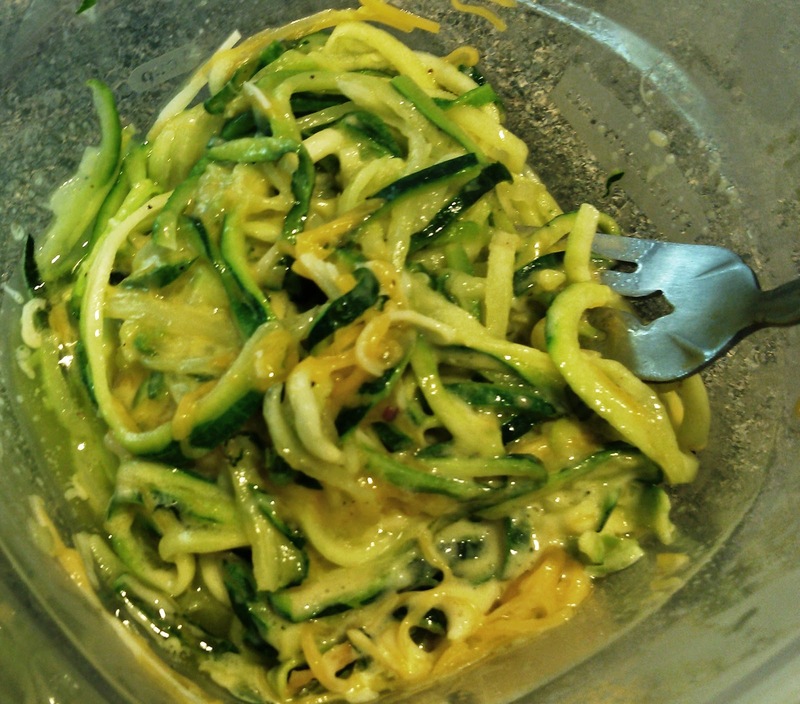 I was able to noodle-ize two zucchinis in under 5 minutes - it was so quick and easy! Cleanup was simple too - the SuperSwizz comes with a little cleaning brush that you can use to clear the blades as you rinse off the slicer; Or, throw it in the dishwasher (major plus for me!) 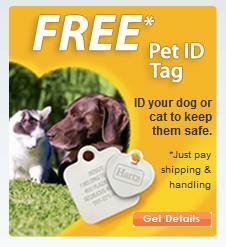 Plus, the whole thing is small enough to fit in a drawer for easy storage and handy access. 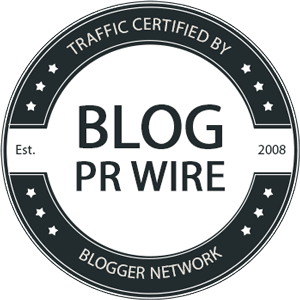 This is so cool and I have used mine a lot. 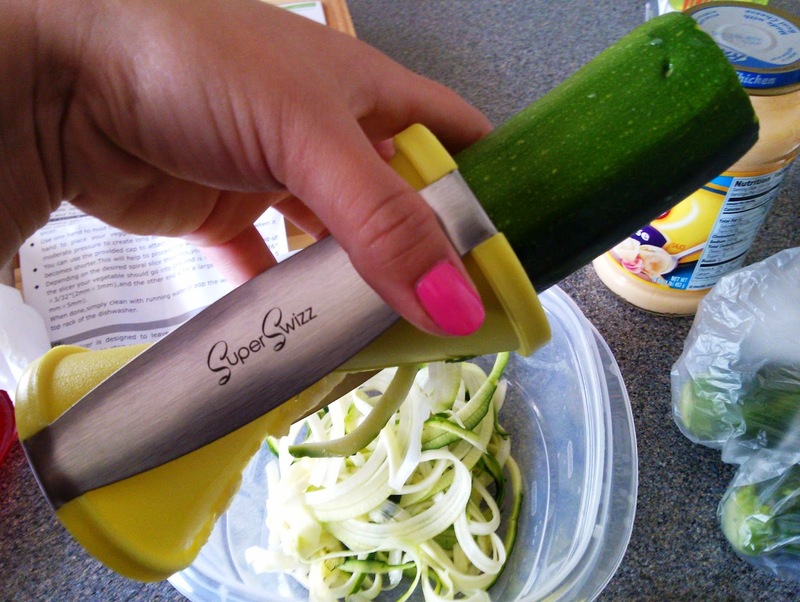 I mainly use it for zucchini although I may try a summer squash in the future. You could also make curly "fries" with sweet potatoes, use it for stir fry veggies, or make fancy garnishes for your dishes. 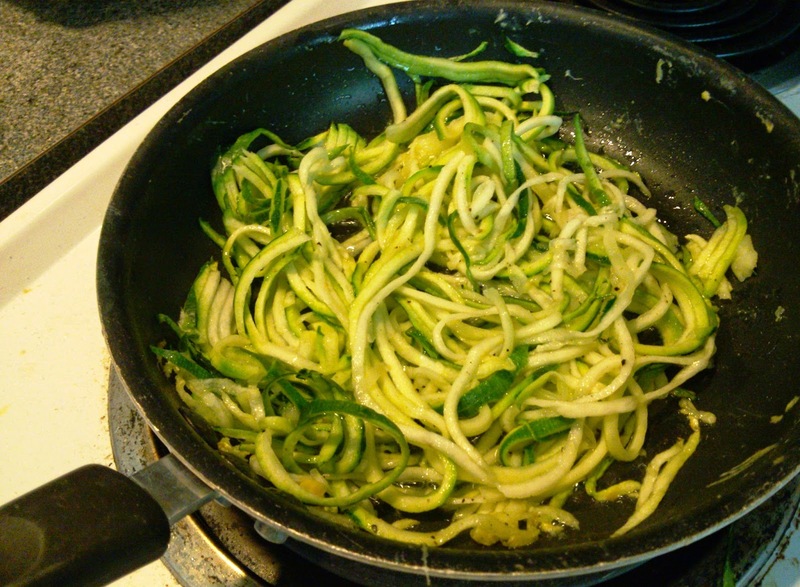 I've tried to cut zucchini noodles by hand before and let me tell you - the SuperSwizz makes it 10 times faster, easier, and less messy! 4. Add sauce of choice - I've used alfredo sauce, tomato sauce, and a "mac & cheese" with cheese sauce and shredded cheese. Easy as that! 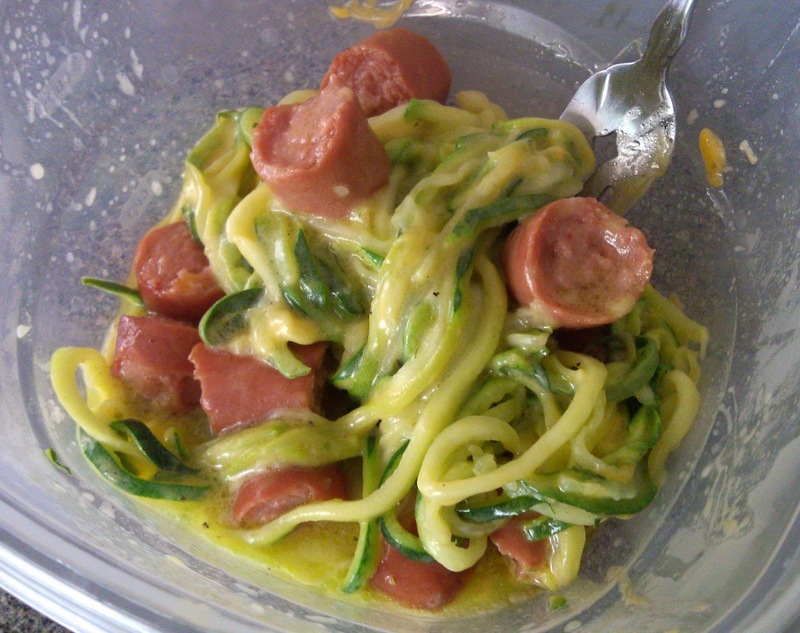 It's tasty, healthy, low-carb, and fun!